So it's getting to the point where you can't really deny it any more, Christmas is well and truly on it's way, before you know it, the presents will be unwrapped, the dinner eaten and the living room scattered with toys. So for those of you who are still looking for the perfect toys for your family, that hopefully won't be discarded in favour of the wrapping paper, over the next 12 days I am going to be featuring a variety of toys aimed at a range of ages from toddler to teen. We will also have some giveaways to help you get an extra present under the tree! Both Be10 and Building Blocks are a favourite in our house at Christmas and Character Building is set to wow again this year with exciting new additions to their range, including a brand new Ben 10 collection! 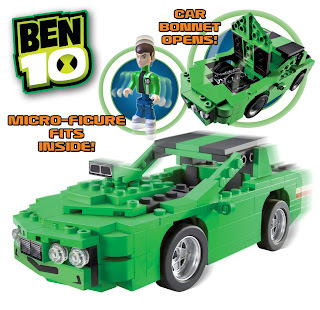 At less than £7 a great little stocking filler than will keep any BEN10 fan entertained over the Christmas holidays!